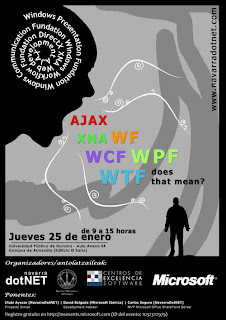 AJAX, XNA, WF, WCF, WPF, WTF does that mean? 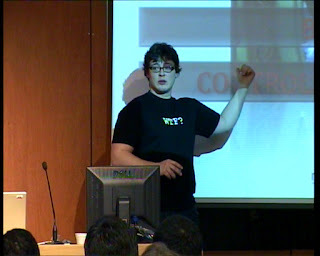 Firstly, we had the chance to learn from David Salgado (http://blogs.msdn.com/davidsalgado/) in his charts about ASP.NET AJAX, WCF and WPF. Amazing !!!! 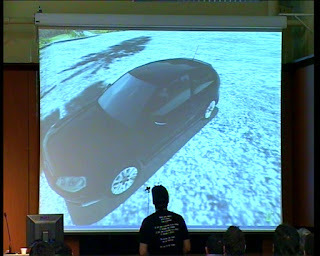 Later on, I talked about Managed DirectX and XNA, including a demo about Simax project (http://www.simax.es). Hope you enjoyed it. 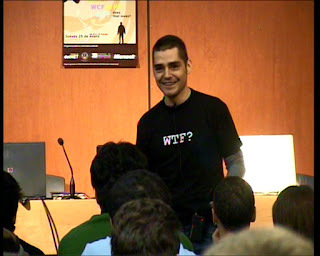 We also learned about WF from Carlos Segura (Sharepoint MVP, http://www.ideseg.com/). Excellent work too Carlos! Thanks a lot to navarraDotNet too ! In order to get no exceptions when resetting the device, due to a resize or to a FullScreen toggle, you must be sure to have freed every single resource of the device, because for each resource, DirectX mantains an internal counter of references. If any of these counters is not 0 at Reset, it throws an exception and the Reset fails. 1.- Every resource must be Disposed in the OnLostDevice() event. 2.- Every resource must be re-created in the OnResetDevice() event. BUT: there´s a singularity to this procedure regarding the DepthStencilBuffers. If you handle depth buffers manually (setting the EnableAutoDepthStencil = false), there´s something you have to be careful with. If you don´t, you will get an exception at Reset. How to decrement the counter? Calling the Dispose() method. Yesterday, while finishing the last details of my Custom ActionMapping system, I noticed a terrible slowdown in my application. In a demo app I was using, the fps falled from 82 to 9 !!!! Looking for the problem, I found that it was due to an access to the Device.DeviceInformation property. I decompiled the DirectInput libraries, and I found that each time an access to this struct is done, a New() object of the type DeviceInstance is created (and don´t tell me why, it´s done twice). This seems to be the source of the slowdown. So, avoid accesing this struct at runtime. Instead, pre-get any values you need for each device, to local structs at creation time. What do we put in the file to identify the physical object? It´s name? It´s ID? It´s offset? Any of them would work if we´d only need to recover info about a physical device, as it´s name, properties, etc. You can do that, looping through the collection Device.Objects, and searching by any of that terms. The problem is that we don´t only need that, we need to retrieve data from that object. Steping back to the previous part, we could think of using Inmediate Mode, and storing in the file the name of the field in JoystickState struct we wanted to map the game action to, regardless of the physical device it´s attached to. That might be a solution, but once we have the JoystickState structure, how do we get the value of a field whose name is stored in a variable? One way to do that is to make an unsafe pointer access to the struct, if you know the address and size of the field you want to retrieve. This is, you know, so C++, that we´ll discard it by now. There´s a simpler and better way...so don´t use inmediate mode. That´s why ActionMapping does so too, I guess. So there´s the link. We choose BufferedMode and go ahead ! This collection has a first dictionary, keyed by the DirectInput Device, and whose value is another dictionary, with all the Actions mapped for that device, keyed by the offset of the object. This is a plain list of the actions available in the application. Initialized for every eGameAction, regardless it´s mapped to a device or not. The best way to store the action map is an XML file in the user´s ApplicationData special folder. This way, the config will be made for every machine the application is installed. To save the settings, simplly loop for every device in mActionMap saving it´s Guid, and a list of actions, just as we´ve seen before. 2.- Recover a device instance by it´s Guid: Just loop throught the Available Devices searching one with the same guid. Once per frame, a DoSteps / OnFrameMove / whatever you like method should be called to update all the data. DirectX Action Mapping has it´s own user interface to configure the mapping. It´s dark, misterious, ugly, unconfortable, strange, a little bit chaotic, and as we are no longer using standard Action Mapping we can no longer use it. So, make your own config dialog, with the appearance you want, and the behaviour you want. 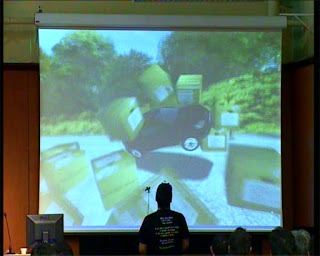 Most of the games makes a controller configuration based on "Listen for any device´s object moving". If that happens, object is assigned to game´s action. 1.- Define a Timer object in your configuration dialog, which is started when the user presses the "Assign" button. 2.0.- Increment a Time Counter. If it reaches the amount of time for listening, get out. In this algorithm you should also apply a Thresold system, because analog devices are almost always reporting small changes. So keep track of the first values returned in BufferedData for every physical object and when newer values come, calculate the difference between actual and first value. If the difference is bigger than Thresold, make the assignment. That´s it ! Hope all this stuff helped you ! - For a joystick, it´s quite trivial to map it´s objects to fields, because JoystickState was originally designed for that: joysticks (as it´s name states). So, the AxisX field will almost always be mapped to the X-Axis of the joystick. Are things different in Buffered Mode? Quite a bit. Action="Steering Action" PhysicalDevice="Logitech G25" PhysicalObject="Wheel Axis"
and Enum.Parse(typeof(eGameActions), attributeInnerText); to recover from the file. 3.- The third attribute.... aaaahhh. This is a little bit more tricky. In the last few months I realized that I didn´t have a decent controller configuration system and I started to look at DirectInput´s Action Mapping. After a couple of weeks working around it, my frustration growed up and I decided to make my own full ActionMapping system (supporting mapping to several devices). Why? 2.- ManagedDirectX version of Action Mapping seems to be incomplete, just like if they wanted to finish asap, regardless what was the final result: undocumented methods, parameters, etc. 3.- Error reports coming out from methods is something just, impossible to understand without good specs. One example: The Acquire() method always throws "Argument Exception". Why? It can be due to a dozen of things. 4.- To push me even forwarder in my willing of comitting suicide, most of the actionMapping samples have been removed from the SDK. As there´s no human able to find old samples in Microsoft´s websites, I had to dive into the pile of old CDs that, thank to the great lord, I haven´t thrown away yet. Hey you gus, why just not putting there a special website with all the DX samples published ever? 5.- Of course, after finding the samples, they are all C++, so you have to bring all your c++ knowledge to life and start studying them. 6.- Even after all this process, I honestly have to say that I couldn´t determine the behaviour of some methods. They seem to be chaotic and I dont understand what happens sometimes. I loose the action map when set the dataFormat and vice-versa. 9.- More and more reasons... The Acion Mapping configuration dialog. What can I say? It´s almost un-customizable. It´s behaviour is absolutely undocumented. I really think that DirectInput is the ugly brother of DirectX. It does not follow the quality standard present in other parts of the libs. Anyway... No more time wasted in ActionMapping. I decided to make my own, custom, brighty, magnificent, easy Action Mapping System. This could seem an easy task, but again, just like always I try to make something new with DirectInput, it´s not. The main task we want to make in our ActionMapping is to be able to save to disk and recover a controller configuration, which assign a InputDevice and an Object of that device to a GameAction defined by us. As this tutorial is gonna take long, I will divide it into parts. Will put all of our actions in an enumeration. Enum.IsDefined( typeof(eGameActions), 6 ): Will return false because eGameActions doesnt have that member. .Net Framework 3.0. DirectX and XNA event. late this month, a new Microsoft event will take place here in Pamplona. Promoted by navarraDotNet, it will cover .Net Framework 3.0 technologies and more. "Masters of Techonology" as David Salgado ( http://blogs.msdn.com/davidsalgado/ ) and Carlos Segura (Microsoft MVP, http://www.ideseg.com/ ) will present some parts of the agenda. More people to be confirmed ! (will post here when known). I also will be there talking about DirectX and XNA. Recently, I had the chance to test the magnificent Logitech G25 Racing Wheel, a superb product for PC racing enthusiasts. Of course, after investing two or three hours of my life with TOCA 2 and the wheel ( yeeeeaaaaaah !) , I started to play with it using Managed DirectInput, just to see what is able to do. Anyway, replace the code with something like this: if (axis.Length >= 1) and it will work. Even logitech´s engineers are not very sure what this method does, as there´s no explanation in the DX SDK docs. Anyway, removing the second call to SetAxes solves the problem. As a conclusion, we are all impressed with the work done in the Managed version of DirectX and we also know it´s been developed by a small team of people with limited resources. Anyway, the documentation lacks lots of explanations, examples, and even methods and classes specs. Hope this will be fixed someday. Just a couple of weeks ago, we had the chance to learn from Chema Alonso in his chart "Los programadores y la seguridad", here in Pamplona. The event was promoted by navarraDotNet, a recent .Net group created in Navarra, with the collaboration of Microsoft and the CES (Centros de Excelencia de Software, www.cesnavarra.net). Thanks a lot to all of them. More coming soon ! Just wanted to say hello and welcome you all to my blog. Any opinion is really welcome !